Is incumbency another word for occupation? In Philadelphia, Nate Kleinman, a legislative assistant to a state representative, has announced that he intends to challenge Democratic Rep. Allyson Schwartz for her seat in the House of Representatives. He has experience working in Democratic campaigns, but emphasizes his Occupy Philadelphia connections and commitments. Berkeley Professor George Lakoff has written that contesting elections is the logical step toward influencing policy for Occupy, while others have argued that Occupiers should focus on the initiative process, rather than particular candidates. Electoral politics is a natural next step for a growing social movement, but it’s not easy or uncontroversial. In real life, activists need to take a position on each election, even if that position is to opt out. But just because one doesn’t want to take institutional power seriously doesn’t mean it will go away. Activists and advocates neglect electoral politics at their peril. For Occupy, which has created a broad political umbrella uniting a broad range of claims about political and economic inequality, there is no trademark protection. Anyone who wants to call themselves an Occupier–or a supporter–can try to do so, and can try to campaign on this identity. Whether or not the people who camped out in urban parks–or the much larger group of people who sympathized with them–will support them is quite another matter. The American political system, offering many elected offices and frequent and routine elections, works to bring movement politics indoors. It forces aspirants for office to build broad coalitions, address multiple issues, and work with people who are at least a little different from them. Far more important than the first Occupiers to run for office will be the electoral choices that the much larger number of activists and supporters make. Surely some will eschew electoral politics altogether, reasoning that the terminally corrupt system forces compromises that make meaningful change impossible. 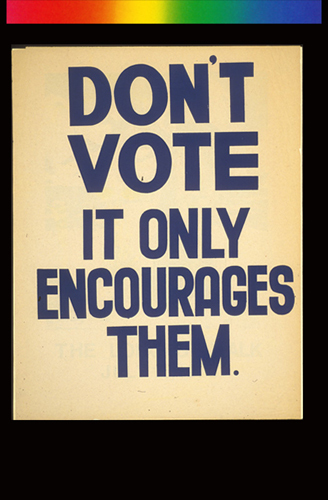 They’ll say: “Don’t vote, it only encourages them.” But elected officials can operate without our encouragement. 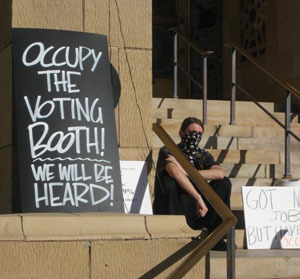 They’ll call self-identified Occupy candidates sell-outs–or worse. I suspect the electoral abstainers will be a sliver of the broad movement, and that most Occupy advocates will haul themselves out to the polls and make a choice from the options in front of them. Call it the lesser of two evils, or call it doing the best you can in a real, rather than imagined, world. Remember, things can always be worse. * Corrected, January 27, 2012. This entry was posted in Uncategorized and tagged elections, Gary Blenner, Jeff Kravitz, Nate Kleinman, Occupy. Bookmark the permalink. This whole idea, of choosing the lesser of two evils, is the very problem people have with the 2-party system in the first place. They don’t want to live in a world were they have to chose the lesser of two evils. Americans have been hauling themselves to the polls to choose between the options in from of them for decades and it’s clearly not working, so people are fed up. Occupy is not about building a new political party within the same system, or reinventing the positions of the Democratic Party. It’s about rejecting the ‘lesser of two evils’ choice all together. It’s about constructing a system that does not claim to ‘represent’ the voice of the people, but IS the voice of the people. I’m not saying no to Occupying Office, or that if a representative candidate with an actual platform for reconstructing the system came along I wouldn’t vote for them. What I am suggesting is that this article is quite derogatory towards those of us who are opposed to representative politics. You deride them as living in an imagined world, as if the end of representative politics is some kind of impossible fiction that can only be from a dream, instead of treating them as what they are: A group of people who have an idea about how to govern themselves. No one, absolutely no one, has any clear idea of how this idea will spread, or how successful it might be. Maybe they will disappear and along with them any dream for getting as close to a direct democracy as possible, or maybe over the next few years or decades they will steer the path of American governance towards a non-representative government that everyone can agree on. Or something else totally unpredictable. So, instead of deriding these people about how they are not participating, suggesting how few in number they are, or how they are somehow not attached to reality, why don’t you write an article that actually explains their position and compare it, in a non-bias way, to the occupiers who don’t mind participating. Perhaps you can try to understand and then explain how some people believe that representative systems are an ineffective method of producing an intelligent governing body and how this idea has a foundation in Heidegger and Merleau-Ponty’s rejection of Cartesian assumptions about how we interact with reality. Or to understand why some people don’t want someone speaking for them and instead want to speak for themselves. Or perhaps you can try to understand the new ways they have developed to participate without representatives. After all, the totally shifted the political focus of the country from debt to inequality without a single candidate standing and claiming to speak for them. 1. There are moral arguments about legitimating a corrupt system and connecting one’s self to it. Thoreau articulates this argument in “Civil Disobedience,” explaining why he pays local, but not federal, taxes. The argument isn’t predicated on changing anything, except one’s own relationship to a power structure. Fine. As politics, however, it’s pretty solipsistic. 2. There are strategic arguments about demonstrating the illegitimacy of a system. If the non-participation rate goes high enough, the results won’t be respected, and outside pressures can force substantial reforms. There’s a wikipedia page that (http://en.wikipedia.org/wiki/Election_boycott) lists largescale boycott campaigns. “Mixed” is a fair description of the results of such efforts, which have on occasion held turnout under 10 percent. I don’t think such a boycott could approach this number of no-shows in the United States, and I’m dubious about the notion of even massive non-voting promoting electoral reform. Remember, one political party is already working very hard to drive turnout down. Negative ads, an increasingly unhealthy part of the political menu, are also designed to drive turnout down. Acceding to this doesn’t seem likely to be productive. Participating in electoral politics doesn’t mean giving up on anything else, being community meetings, protest, or civil disobedience. In American history, social movements are most successful when activists are engaged both inside and outside political institutions. To be sure, such efforts haven’t created a startlingly new political regime in America–nor are they likely to in the future. They do, however, affect things like voting rights, tax policy, health care, and the environment–and much much else. I think all of this matters. And, as I said in the post, it’s important to remember that things can always get worse. FYI, I resigned my position as a Legislative Assistant at the end of November and have been organizing/participating in Occupy Philly full-time since then. My background is in human rights activism and community organizing, in addition to a few Democratic campaigns. Thank you for adding that information. FYI, Gary was a member of the board of the Center Unified School District from 2006-2010. In the interest of completeness and accuracy, can you correct the story in re: Blenner was an incumbent, and already held the office? Your own link to Blenner, when clicked, verifies this. Thanks. Again, thanks. See the corrections above. Thanks…Do you want me to add you to Occupy Sacramento’s media list? Thank you; I’d appreciate it.